Gloeocapsa magma. Ever hear of it before? Perhaps you haven’t heard of it but we guarantee that you have seen it. Curious? Gloeocapsa magma is the algae that grows on composition shingles, causing unsightly streaks and stains. The amount of gloeocapsa magma on a rooftop is a common way in which people estimate the age and condition of a home’s roof. If a home has a lot of dark streaks on the roof, prospective buyers of that home assume the roof is on its last legs and, as a result, the roof condition becomes a bargaining point for the home’s value. Beyond that, these dark stains also have a huge bearing on the curb appeal of a home. If you’re like most homeowners, that means something to you. You want your home to look as nice as possible and gloeocapsa magma just detracts from its overall beauty. Here’s the issue though. Whereas it used to be that dark streaks were primarily a problem on roofs in damp climates, we now see it occurring on roofs in virtually all climates. And, it’s not really a marker of roofs that have some age on them. We see gloeocapsa magma occurring on roofs that have been up as few as three years, making a roof look much older than it really is! In order to keep down the cost of composition shingles, manufacturers have begun to include more “fillers” in their “recipes”. These fillers replace some of the oils in the shingles. Of course, those oils are normally the most costly component of the shingles. Removing the oils often seems to shorten the lives of the shingles, making them less resilient and supple. But, an additional problem is that the gloeocapsa magma feeds off of those fillers, leading to the unsightly streaks and stains. A predominate filler used in composition shingles, because it is so plentiful and inexpensive, is limestone. It is the calcium carbonate in limestone that gloeocapsa magma really likes to feed off of, along with moisture that naturally collects on a roof’s surface. Once the algae growth becomes noticeable as those dark streaks on the roof, gravity and rain water flowing down the roof carry the spores down the roof, causing the commonly seen pattern of streaks extending downward on the roof. And, as the algae feeds off of the limestone over time, it invades the structure of the shingles and shortens their lives. Recent years have seen the growth of a “roof cleaning industry”. This industry targets homeowners who want to get rid of the dark streaks and stains on their roofs. There are two primary ways in which this cleaning is done – one is by power washing and the other is through the use of harsh chemicals. Both of these processes, especially if done repeatedly, are documented to shorten the life of the roofing shingles by further breaking them down. So, you may wonder, how will a beautiful metal roof stand up to gloeocapsa magma? Generally well but we do not want to overstate the benefits of metal roofing so allow us to give you a few details. Metal roofing does not have the limestone and other fillers that support the life of algae including gloeoecapsa magma. However, in environments which allow for dirt accumulation on the roof, such as roof areas beneath trees, that dirt can gather on the roof and support biological growth. Tree sap can worsen the situation. Dirt and biological growth, if it accumulates on a metal roof, does not threaten the integrity of the roof and it can be cleaned off if desired without damaging the roof. The use of a dark colored metal roof in areas that might be prone to dirt on the roof can help to hide the dirt as well as any biological growth that feeds off of the dirt accumulation. Metal roofing can be a great way to help avoid the heartbreak of gloeocapsa magma. Your metal roof can keep its beauty and protection intact no matter what mother nature throws its way. 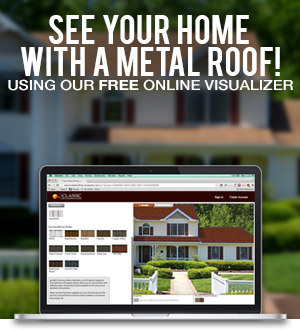 And, you can even use our free online Metal Roofing Visualizer to upload photos of your home and see how it would look with a metal shake, metal slate, or other metal roof. Please contact us or call us at 1-800-543-8938 whenever you’d like to continue your research into metal roofing and its many benefits.